But before I share my noodlings with you, I need to reveal my sea fan experiment from last month. After printing the light fan shapes and the darker water, I added some coral shapes in the background. It amazes me how adding a brighter and darker color makes the water so much lighter and does add lots more depth. The coral shapes have three colors in order to hint at dimensionality. There is a great deal of activity in the work, and not many places for the eye to rest. I often need to live with a linocut for a while before I decide if it will make it to a frame, or get flipped and used as a test print. Sea Fan linocut. It doesn’t get a name unless it warrants a frame! So back to negative space — or in the design world, “white space.” There are lots of famous examples of the use of white space. This about the face/vase illusion for example. In all of these, the positive and negative spaces make your brain work to decide what it is seeing. This entry was posted in Composition, Experimentation and tagged design, Linocut, Matisse, negative space, reduction, sea fan, white space on August 9, 2015 by Elizabeth Busey. It has been a long time since I worked 14 to 16 hour days at this pace — perhaps going back to graduate school…or the early months of motherhood. I’ve been preparing for a show at the Bloomington Monroe County Convention Center which opened Friday will hang through July 26th. I am now in the midst of the Bloomington Open Studios Tour. The traffic is light on Sunday mornings, so I thought I would post some images of what an Open Studios looks like. I’ve talked more in the past 48 hours than I have in the past four months, so I’ll let the pictures do most of the talking. 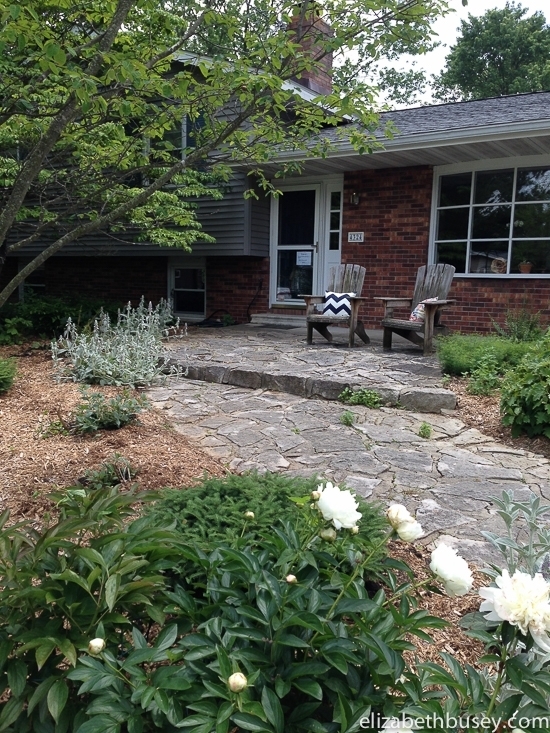 The front walk is weeded and ready to welcome people to my home studio. This entry was posted in Open Studios and tagged Bloomington Open Studios Tour, demonstration, sea fan, studio on June 7, 2015 by Elizabeth Busey.